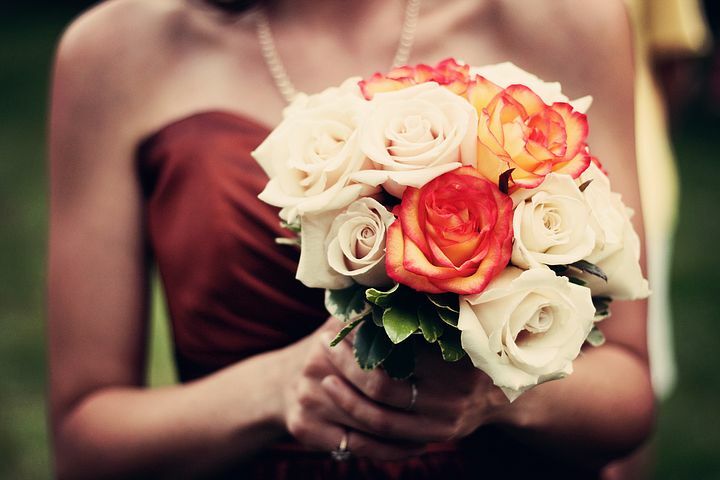 1ST N WEIGHT LOSS: Brides - Do You Need To Drop A Dress Size before Your Wedding? Brides - Do You Need To Drop A Dress Size before Your Wedding? The stress and anxiety that most brides, and bridesmaids experience as the wedding day approaches can be overwhelming for them. The amount of preparation involved and the countless number of details needing attention can make it very difficult to eat sensibly and maintain even a modest level of good nutrition. I can recall countless conversations with both brides, and bridesmaids who are so stressed out in the month or so before the wedding that they abandon all good eating habits and either starve themselves or binge on junk food to handle the stress. Many are genuinely terrified they will be overweight and unattractive on the wedding day or even worse won't be able to fit into the dream wedding dresses, or gowns. As an Accountability Coach, and Personal Trainer for the past 15 years, I continually remind others how just a few simple changes to their daily routine can make a huge difference. The four basic principles I outline below really do work.....only if you are willing to work also. I've had personal success using these strategies and continue to follow them on a daily basis. Many of my clients who have requested my help and followed this advice have had remarkable results. Start this program at least 3-4 weeks before your wedding day and see for yourself. Hydration is critical. While the benefits are countless this is one of the hardest things to implement into your daily routine. Whenever my clients would neglect this item, I would recite how water lowers body fat, flushes cellulite, improves digestion, gets rid of dark circles under the eyes, and makes you feel full. These are just a few of the benefits of drinking the recommended daily allowance of water per day. Keep a bottle of water beside your bed. Before you go to sleep drink 1/2 the bottle and as soon as you wake up (before your feet touch the floor) drink the remaining 1/2 bottle. note* I can't overemphasize how important this 1st step is. Start with this...you can always increase later after it becomes routine. It is enough to gently boost your metabolism and keep you active. Before I started this method of eating I would starve myself for a couple of days whenever I wanted to lose weight. It seemed logical to me at the time. When I started personal training I had to modify many of my bad eating habits. I had to start eating 6 meals a day. Don't panic, it's easier than it sounds. Every 3-4 hours from the time you wake up eat a little something. Your digestive system is far more efficient at handling a series of small meals than it is at tackling one large meal. I usually eat at 7am, 10 am, 1pm, 4pm, 7pm and 10 pm (may vary for each individual). Your meal portions (meat, veggies, carbs) should be no larger than the palm of your hand and no thicker than the palm of your hand. I could spend days offering suggestions on meal variations but there are many excellent books that have been written to give you ideas. I will share my recommendations in another upcoming article. So to make it simple a typical meal should be a protein, a carbohydrate and a vegetable or fruit. 5. The Best Part...Reward Yourself! Choose one day a week as your reward day and eat whatever you want, keeping in mind the portion, and serving size. Don't worry, you won't gain fat if you do this because for the past six days your body has been use to eating what I term clean food. On the seventh day your body thinks you are going to do the same and when you don't it gets fooled and eliminates the effects of the junk food. In essence you are tricking your body that day but you MUST eat cleanly on the following day. Depriving yourself of the foods you like for WEEKS, and MONTHS, will only lead to binge eating, feeling guilty, and eventually talking yourself into giving up. I have told many upcoming brides, and bridesmaids about this method of eating and almost all of them have emailed me back to let me know how thrilled they were at reaching their target goal of weight loss. I hope it works for you too. As a final note of encouragement, my daughter used this method of eating and in 1 year she went from a size 18 to a size 2. This was four years ago and she has still maintained her weight to this day. These simple techniques will not only help you quickly, safely and effectively lose at least one dress size but they will also help you feel more energetic, vibrant and healthy. Not to mention the positive effect it will have on your skin texture and overall appearance. Stay on track and you will be amazed at your results. Eat well, drink plenty of water and as you progress, simply imagine being seen for the first time in your wedding gown, or bridesmaids dress and watching as the jaws drop in speechless silence.